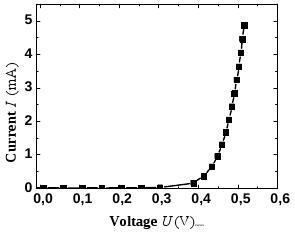 where I is current through the diode, I0 is the reverse diode current, e is the elementary charge, U is the voltage, k is the Boltzmann constant, T is the temperature and a is the coefficient of diode ideality, e is the base of the natural logarithm e = 2,71 (Fig. 1), . 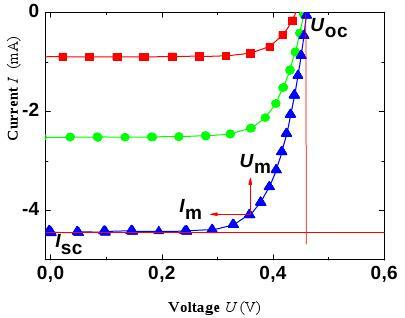 where Isc is a short-circuit current through the cell which may be influenced mainly by optimisation of transport properties, flexibility, cell geometry and the width of an active layer, Uoc is open circuit voltage which my be influenced by the choice of materials and FF is the so called the filling factor of the photovoltaic cell given by the quality of contacts and material morphology and also dependent on the resistance of an active semiconductive layer. 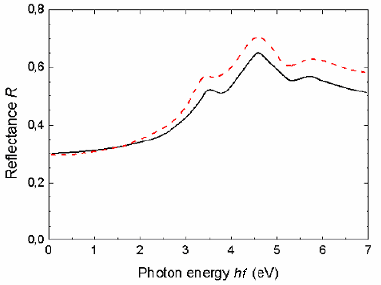 Efficiencies of contemporary photovoltaic cells range from 1-30 %. 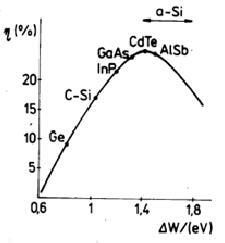 Figure 3 Dependence of the theoretical efficiency of the photovoltaic cells on the bandgap ΔW of the semiconductor, c-Si-crystalline silicon, a-Si amorphous silicon. R. Bonnefille and J. Robert, Principes generaux des convertisseurs directs d energie, Dunod, Paris, 1971. J. R. Chelikowsky and M. L Cohen. : Phys. Rev. B14, 2 556-582 (1976).